This apron remind me of my grandmother, Mimi, who favored aprons with a bit of panache, her own mix of cheek and frills. As a child, this meant fun dressup worthy aprons when I went to her house to cook, which I did quite often, She would also have loved this black hostess number. Because, seriously, black hostess aprons . How Mad Men is that? Check out all of tarazara's Vintage Inspired Aprons on etsy. Dear FTC: re: blogger disclosure ~ Tara is a friend of mine, but nothing of value has changed hands in relationship to this post. She has, however, given me many things of value over the years: advice, well-placed humor, support, an occasional virtual smack upside the head, and mostly friendship...but since it has pretty much all taken place online, I assume the NSA already knows all about that. Tis the season to covet shiny things, and these knives are at the top of my current list of tools to drool over. I used a Shun knife once and it was oh so sweet: well balanced, comfortable, sharper than sharp, and that blade is so darned pretty to look at. Then I went home to my haphazard collection of cheap knives, with that sweet Shun but a fond memory. Dear FTC: Yes, that is an affiliate link and, if people click on it and shop at Amazon, I may make a few nickels. If I make enough nickels, I might buy myself some of those Shun knives. I am not holding my breath. edited to add: someoneElse looked at my computer and commented on the lovely Shun knives. Asked what was so cool about them. I babbled something marketing-like and reminisced about how lovely the Shun I played with felt in my hand. Those lovely Shun knives are now making their way from Amazon's warehouse to my house. Simply. Lovely. Now, go, shop. Don't forget to buy yourself something nice, too. One of my long-term goals is a reorganization of my multiple blog disorder syndrome (MBBDS), a malady which I am guessing will be in DSM VIII. The first step is admitting you have a problem. Ah! I feel so much better. The next step is creating a new blog: kitchenMage's Reviews so all of my opinions about things you can buy have a home. My first review, of a lovely shopping spree courtesy of BlogHer and JCPenney's is posted. Wander over and see how I spent $300 without taking off my fuzzy slippers. This may be the answer for people who, like me, hate mornings but adore bacon. The Wake n' Bacon is an alarm clock that wakes some lucky person with a waft of freshly frying bacon. A cute little wooden pig hides a small cooking chamber where a slice of bacon is cooked just in time to wake you up with a hungry smile on your face. The only downside that I see is that you have to load the bacon before you go to sleep so it spends the night sitting there being a laboratory for bad bugs to grow in - meaning you probably don't want to eat it. Well, you probably want to, but you shouldn't. 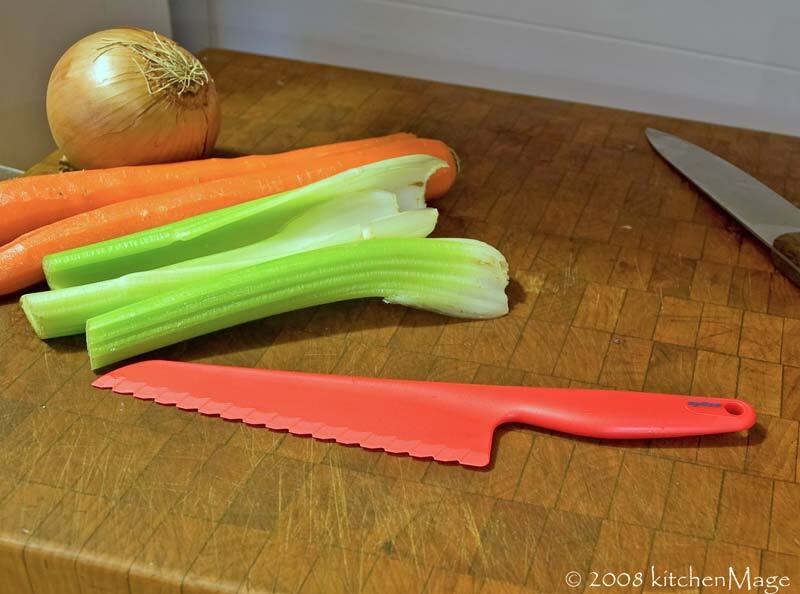 Tonight I bring you the tale of the plastic knife and the pot roast, in which we will attempt to answer the question: Will the little red plastic knife be able to cut up vegetables for a pot roast or will it have to call on the reinforcement knife lurking in the background? The bright red beauty is a Zyliss salad knife - theory being that if you cut your salad with plastic/nylon instead of metal the lettuce won't oxidize and turn icky brown. I tear lettuce for salad by hand so that purpose was of little interest to me, but I have been looking for kid-safe tools and wondered if it would work to cut veggies but not fingers. Setting my expectations at some reasonable level, I decided that I would try something soft to start with. Handing the knife and a tomato to someoneElse, I watched, ready to admit defeat when the knife mangled the tomato.